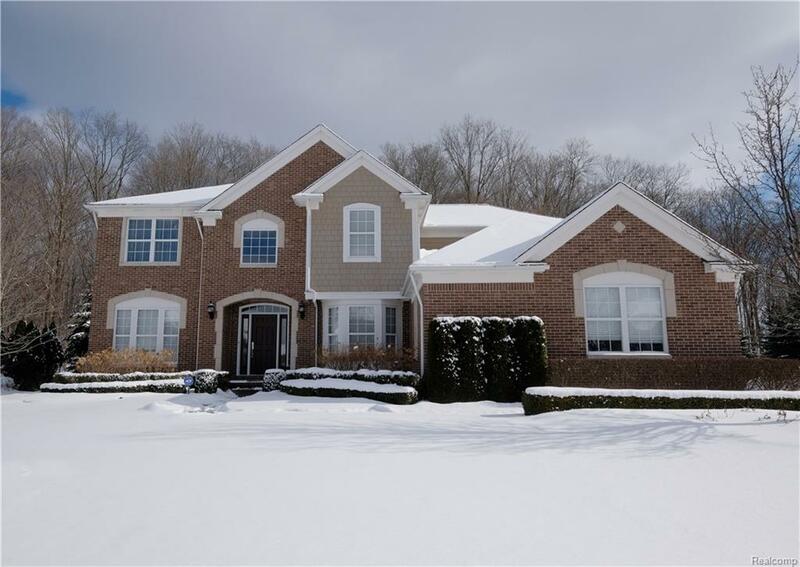 Stunning 4 bed, 4.1 bath brick Colonial on a serene wooded lot in sought after Estates of Arcadia Ridge. Enter the beautiful estate to an impressive 2-story foyer bordered by the dining room & formal living room. Custom finishes & attention to detail can be found throughout inc. hdwd floors, columns, crown molding & wainscoting. Entertain in style from the gourmet kitchen w/ large island, granite counters & stainless appliances or from the finished lower level w/ full kitchen & granite bar. Added features inc. an impressive 2-story great room w/ corner fireplace & private study. Dual staircase leads to expansive upper level w/ walkway overlooking the great room. Spacious mstr suite w/built-in shelving in the walk-in closet & luxurious master bath w/ soaking tub, tiled shower & his & hers vanities. Junior suite w/ private bath & 2 bedrooms connected through a Jack & Jill bath. Professional landscaping w/ a brick paver patio & 3 car garage complete the exterior of this remarkable home.